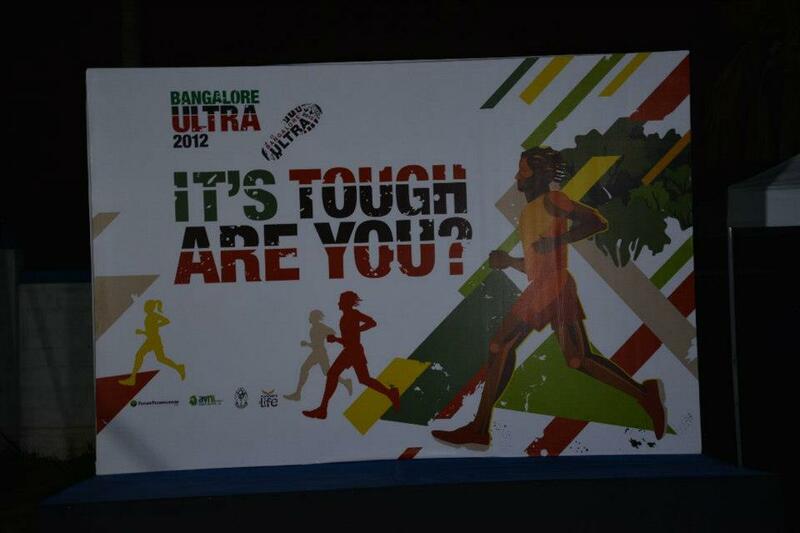 That pretty much sums up my 50Km run at the 6th Bangalore Ultra on 10th November. And this was as per my plan. The first half took 2:19:19 at a little over 5:30 per Km. The second half was much slower taking 2:48 at 6:29 per Km. 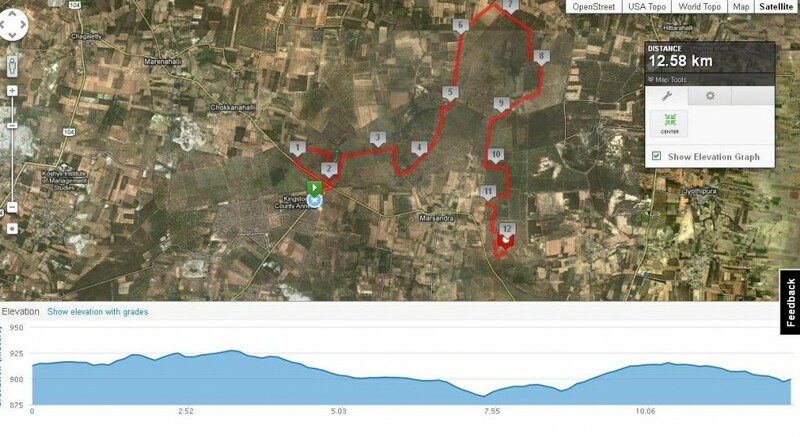 Enjoyed the new wider, flatter trail at Hennur road and certainly the 25Km loop was helpful though it meant seeing other runners less frequently. Complete results are available here.I finished 4rth in the senior category and 11th overall. While in 2011 with a timing of 5:24:11 I finished 3rd overall. Shows the quality of the runners in this year's ultra and also the improvement that runners are making over years. Ravi Venkatesam and I left Domlur at 430am and reached the venue around 5:20am. After the turn into Hennur road from the ORR there were RFL signs and soon after we were part of a convoy of cars heading to the Ultra. It felt a few degrees cooler as we got off the car and walked to the holding area. the holding area was well spread out and was buzzing with runners checking in their bags, stretching, catching up with fellow runners. I met Tanvir Kazmi of runinfinity fame targeting a 24 hour run. And several friends from Bangalore : Sunil, Jugy, Vasu, Venky etc. After brief words from A1 and A2 the race started exactly at 6am. There must have been about 150 runners for the 50Km category. 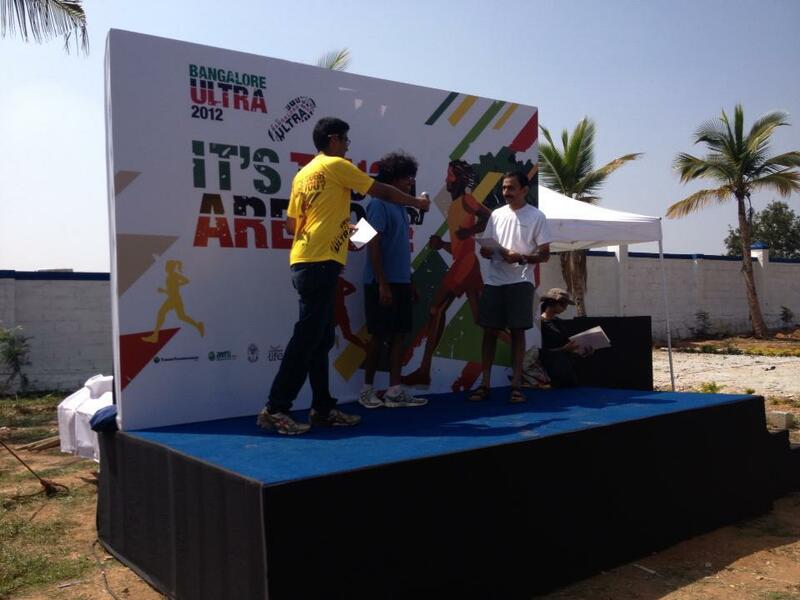 Hari Menon and I decided to run together as he was also targeting a finish between 4:45 and 5 hours. After the first Km of broken road from the holding area the rest of the route was mud trail mainly through bamboo and eucalyptus forests. It was great running with Hari and learning more about his running and cycling experiences. I was surprised to learn that he had never run beyond 31Km. However, he had a very strong HM at KTM this year. After about 6Kms into the trail we started to see runners from the longer distances who had started an hour earlier returning back. Between the 10Km and 12 Km mark(BTW - there were no Km markers on the trail which was disappointing and not expected of RFL) my shoe laces came off twice. At this time Hari Menon took off and I could not keep up with him. I decided to run at my own pace - did 12.5Km in 1:08:39. Soon after the turn around point Vasu and Pankaj Rai caught up with me and from then on for quite sometime the three of us ran together. They are fantastic company and we talked about various topics. After the 35K mark Vasu slowed down while Pankaj pulled a little ahead of me. At the 37.5K turnaround I spent a couple of minutes helping Praveen with the sumo wrestler stretch to help assuage the stress in his groin muscles. 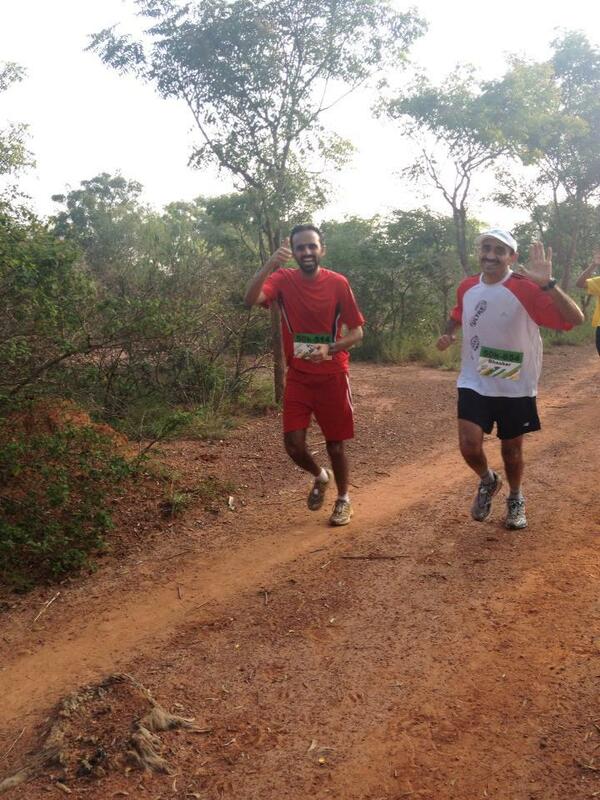 Towards the end I caught up with Pankaj and we sprinted the last 200m and crossed the finished line together. 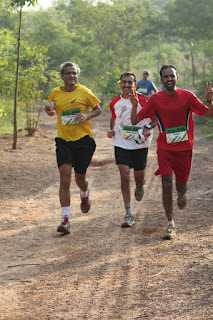 Of course, Pankaj finished the race 7 minutes faster than I did as he had started his race late. Hari finished his first Ultra(including a first FM distance run) in an incredible 4:23:28 and was awarded second position in the men;s open category. As a result I was awarded the 2nd runner up in the senior category though I actually finished 4rth! 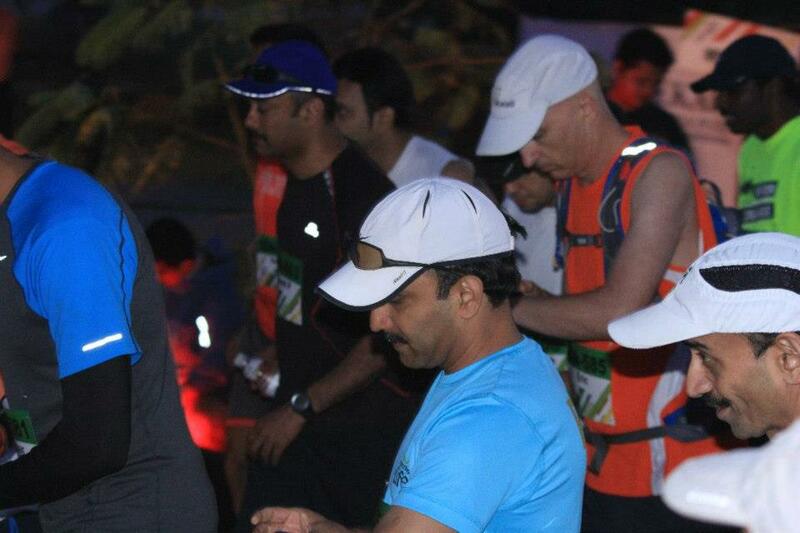 Many runners did incredible timings in the 50Km including Madhu from Egypt who ran her first ultra in 4:35:44. Also many runners including Ravi venkatesam did their 1st ever ultra. The food was much much better compared to previous ultras as well as KTMs. We left from the venue around 1:45 and reached home a little after 3PM after another wonderful race experience! !